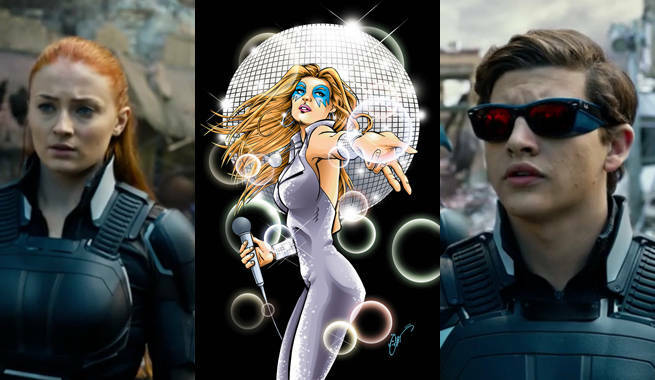 Dazzler fans, get excited: she's officially being introduced into the X-Men movie universe. Of course, it's just as an Easter Egg for now, but at least she exists. Sophie Turner, who plays the young Jean Grey in the next film in the series, X-Men: Apocalypse, posted a "Flashback Friday" picture this morning, of "that time Cyclops and I went shopping at the mall and found our favorite singer's album." The image shows Jean, Scott, and Jubilation Lee (it looks like, in the background with her back turned) at a record shop. Cyclops is proudly holding: "Dazzler: Sounds of Light and Fury" in his hands with a smile on his face. Dazzler is a mutant who converts sound into hard light that she can use in combat - or just on stage as a visual component of her successful music career. That's where the character started off in the comics, so this at least opens her up to the possibility of crossing into a live action world. She's probably best well known to the general public from her inclusion in the classic X-Men arcade game a couple decades ago. She's also appeared in several team line-ups since her first appearance in 1980, and has had a couple of solo series and one-shots. 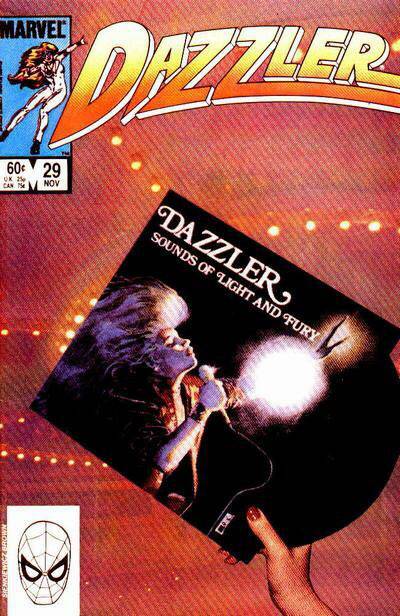 The image itself from the album cover for "Sounds of Light and Fury" comes from the cover of one of those solo series, Dazzler #29. The issue shows that exact album cover. It's an Easter Egg within and Easter Egg! She's an especially interesting mutant because she manages to use her mutant powers for fun and in a successful pop career, right out in public, before she ever even contemplates using them for fighting supervillains. It's a stark contrast to the mutants we've seen in the films so far, who are all sound and fury.